On a scorching Saturday afternoon, in honor of the 1965 Yates and Vanier Cup winning team, the Varsity Blues football team were unable to overcome costly penalties and offensive miscues falling 37-18 to the visiting Queen’s Gaels. One might have expected a game reminiscent of the clash of the titans between the two historic rivals. However, both the Blues and Gaels came out surprisingly flat in the first quarter, with neither team managing to put together much of a drive in the opening 15 minutes. U of T looked particularly poor, with veteran quarterback Simon Nassar completing only two passes for 33 yards. The second quarter saw Queen’s begin to move the ball effectively, scoring a single point off a punt into the end zone, as well as a pair of touchdowns in the final three minutes of the half. U of T’s offence was still unable to gain any headway; the defensive line was exposed to repeated attacks by Queen’s quarterback Nate Hobbs for huge downfield gains. The Blues took a 15-0 deficit into the locker room at halftime. In the wake of a halftime presentation in honor of the 1965 Yates and Vanier Cup Championship Varsity Blues team, U of T’s offence found their stride and came out firing in the third quarter. The Blues were able to march 65 yards in 10 plays to score a touchdown on their opening drive of the second half — successfully breathing some life into a Varsity Centre crowd which had little to cheer for during the first 30 minutes. After the game, blues running back Divante Smith credited the team’s mentality at halftime as the driving force of that quick third quarter start. The Gaels answered back with a touchdown of their own, pushing their lead to 22-7, but the Blues responded quickly with a touchdown, then a field goal, to close within four points of the lead midway through the fourth quarter. The blues’ rally was ultimately stymied by a number of costly and unnecessary roughing penalties, allowing Nate Hobbs to run in another touchdown, as well as a game ending fumble recovered in the end-zone by Queen’s, putting the game out of reach for the Blues at 37-18 with five minutes to go. After the game head coach Greg Gary admitted that the team has a lot to work on in preparation for the Red and Blue Bowl on October second when the Blues face GTA rivals York. March madness, college football, and D1 schools — these terms should all be instantly recognizable to sports fans and enthusiasts across Canada. What all three have in common is that they are synonymous with America’s National Collegiate Athletics Association — more commonly referred to as the NCAA. The NCAA is the upper echelon of varsity athletics, reportedly pulling in just under one billion dollars in annual revenue in 2014. The triumphs and scandals of NCAA teams frequent US headlines and trickle into Canadian media and sports culture. Millions of Canadians create March madness brackets every year, and there is a constant stream of boosting and coaching scandals appearing north of the border. But why exactly are our newsfeeds flooded with NCAA discussion instead of our own Canadian product? The amount of coverage dedicated to the closest Canadian equivalent to the NCAA, Canadian Interuniversity Sports (CIS), lacks in content and frequency when compared to the NCAA — in part because of the media structure we currently live in. Small sources can not make much of an impact when reporting on CIS championships when major Canadian news organizations decline to cover the same events as heavily as they do the NCAA. This lack of coverage, when combined with the fact that U of T students — and Canadian university students in general — do not regularly engage with university sport, makes the market for covering the CIS small. Along with their masses of collegiate fans, the NCAA also boasts a clear financial advantage over the CIS in marketing and advertising. In the US sportswear companies such as Nike, Adidas, and Under Armor sign seven-figure sponsorship deals with colleges to own commercial and apparel rights. If you walk into any of the ‘Big 10’ colleges’ sports stores, you can expect to find jerseys embossed with the number of your favourite player. Because, in US collegiate sport you not only know who the players are, but you actually have a favourite. Reporting on the Blues’ recent football home opener I was completely unaware of the surnames of the opposing McMaster Marauders. At the same time, like a lot of avid sports fans, I can rattle off the names of the top NCAA football programs in a heartbeat. 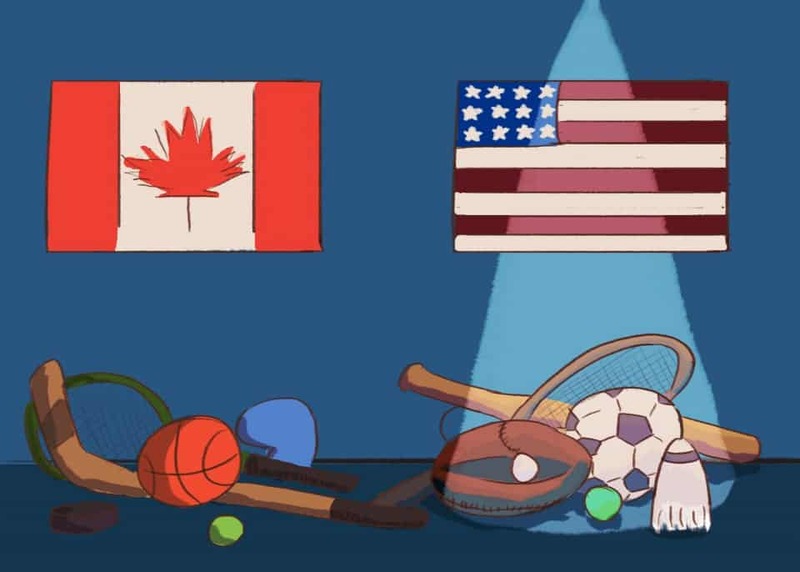 Aside from the lack of media coverage, there is also a common narrative that discredits Canadian varsity sport — the CIS lacks worldwide notoriety and does not seem to produce the magnetic star athletes who go on to play professionally. The sheer amount of programing devoted to the NCAA also outweighs that of the CIS. On Saturdays, from noon till night, any sports fan can find a number of NCAA football games airing on television, but the same cannot be said of the CIS. This disparity however, can also be attributed to the rule differences between American and Canadian football, the same differences that are evident between the CFL and the NFL — due to the lack of knowledge regarding Canada’s rule system, an information divide exists atop a popularity divide. The sad truth is that there just isn’t a market available for the CIS to rival the well-oiled, better funded, NCAA machine. Superior branding has even casual fans relishing the opportunity to redeem themselves from last spring’s busted bracket in the 2016 March madness tournament. The NHL’s New York Islanders recently drafted Andong Song, an 18-year-old defenseman from Oakville, in the sixth round of the 2015 entry draft. Picked 172 overall, Song’s selection by the Islanders shouldn’t have been remarkable, however, what made the pick so revolutionary is that Song is the first Chinese-born player to be selected in the NHL’s entry draft. The debate continues over whether professional sports are becoming more diverse — by actively seeking more ethnically, culturally, and racially diverse rosters — or if individual countries themselves are doing more to promote involvement in non-traditional sports. Regardless, the addition of Song into the NHL is a huge step forward for the league. In order to inspire the same degree of athletic diversity within campus sport and athletics, the president of University of Toronto Mississauga’s (UTM) Athletic Council (UTMAC), Belal Raifai, believes that it’s the job of organizations like UTMAC to actively promote inclusivity and diversity in their campaigns. “UTMAC has a responsibility to promote teams and create events geared towards non-traditional sports,” said Raifai, adding that one of the top priorities of the council is to make sure that the student body’s diverse athletic needs are met. According to a recent survey by the Institute for Diversity and Ethics in Sport, the NBA is the most diverse professional sport organization, boasting an A+ grade when it comes to racial hiring. However, a study conducted by Elias Sports Bureau found that Major League Soccer (MLS) is the most diverse league in North America in terms of international players, with 42.8 per cent of MLS players being born outside of Canada and the US. The study ranked the NBA fourth behind major league baseball and the NHL. Song, who acknowledged in a recent interview, that it was hard to find rink space to practice on, and even harder to enter tournaments because of the lack of established leagues and teams in China, is excited to play professional hockey in America where there is well-established hockey culture. “China just started broadcasting NHL games,” said Song, adding that he hopes his new opportunity will promote hockey in China. Kamal Ali, director of intramurals and campus recreation at UTMAC agrees. “We promote to students to come and play and try out new sports,” said Ali, who asserts that recreational and drop-in sports like cricket, ultimate frisbee, and table tennis are increasingly important because they get a more diverse group of students participating in campus athletics. With the beginning of the regular season a little over a month away, both the men’s and women’s Varsity Blues basketball teams are focused and aiming high for 2015-16, with both teams rosters having changed considerably from last year. With both teams having quite a bit of roster change from last year, the Blues’ basketball team is looking forward to training and developing players both new and told. After ending the 2014-15 season with a defeat against Windsor in the first round of the Ontario University Athletics (OUA) playoffs, the men’s basketball team is preparing for redemption, and is starting the season afresh with some brand new talent. The team is getting close to finalizing the starting line up and appointing captains, as tryouts are coming to an end in the next few weeks. “[A] minimum of seven different players will be on the roster this year,” said men’s head coach John Campbell, adding that chemistry will be an evolving process throughout the season and will be essential to the team’s success. Last year, the team ended their season in the second round of the OUA playoffs, when they were eliminated by the Windsor Lancers — who would go on to become the 2015 CIS champions. This year, Garner and Addo’s top priority will be qualifying and competing in the 2016 CIS Championship, adding that the combination of skilled veterans and determined rookies will take the team on a fun and successful journey. The men’s and women’s Varsity Blues basketball teams will play their first games at home on October 2 at 7 PM and October 16th at 7 PM respectively at the Goldring Center for High Performance Sport. Although there are multiple studies and medical journals asserting the effectiveness of the ‘dark room therapy’ both Bouchard and Geneau received, Dr. Michael Hutchison, assistant professor and director of the concussion program at U of T believes that there are more effective means of treatment. “We are moving away from the dark room and believe more in an active recovery,” said Hutchison, “for no other injury are patients told not to exercise so concussions are no different.” Although the differences are minimal in the treatment available to varsity athletes who suffer concussions versus the treatments offered to professional athletes like Bouchard, Dr. Paul Comper, a clinical neuropsychologist at the David L. MacIntosh Sports Medicine Clinic, says that a major concern is that varsity athletes are students first, and athletes second. Professional athletes tend to want to get back in the game as soon as possible, as many rely on sponsorship deals and prize money to earn a living, and have unlimited access to teams of therapists to help them get back into the game. In comparison, varsity athletes who also have access to doctors and therapists, are concerned about their ability to keep up with their academics. Statistics in varsity sport are scarce, and according to the Sports Concussion Institute five to 10 per cent of athletes will sustain a concussion in a season. At U of T, varsity athletes on the baseball, basketball, field hockey, football, ice hockey, lacrosse, rugby, soccer, wrestling, and volleyball teams must all complete a pre-season cognitive and vision screening before they are cleared to train and compete. The screening gives doctors, coaches, and therapists a baseline in the event of a head injury. Concussions can seriously dissrupt and possibly end an athlete’s season. Depending on the severity of the injury, some athletes are forced to take time off classes, which can put their academic year in jeopardy. Speaking from personal experience, recovering from a concussion can take a major toll on your academics. After sustaining a concussion a few days prior to midterms, I ended up withdrawing from most of my courses because, by the time I was feeling well enough to complete assignments, it was too difficult to make up for the time I spent recovering. Geneau also found herself in a similar situation; in order for her to maintain her eligibility and play the following season, she needed to take four summer courses. “It is common for students to have to drop classes because of how much work they have missed,” Comper suggests. For some athletes, the fear of being hit again remains when they’re finally cleared to train and compete. Blues track and field athlete, and former volleyball player, Emily Kawaguchi says she hasn’t played a game of volleyball since sustaining a concussion in a warm up over a year ago. “That was my life before and so it’s crazy… I want to play,” said Kawaguchi adding, “but also there is a fear of getting hit [again] because I am not even better from this [concussion].” Although the psychological damage a concussion can inflict on an athlete is detrimental, and can be, in Kawaguchi’s case, career-ending, a small percentage of concussed athletes experience post concussion syndrome. The disorder consists of various symptoms ranging from dizziness to migraines, which can last for weeks after the initial injury. Geneau still experiences difficulty looking at screens and motion sickness as a result of her concussion. Amy Dinaut, the physiotherapist for the Varsity Blues men’s hockey and women’s rugby teams, maintains that although it’s near impossible to give a standard recovery timeline for a concussed athlete — since treatments vary depending on the individual and the severity of the injury — an active approach to rehabilitation, as opposed to sitting in a dark room, is the best bet. “Concussion treatments of the past used to have people do nothing after the injury,” said Dinaut. Athletic staff from both the MacIntosh Clinic and Concussion Program closely monitor the active approach, which involves mild cardiovascular, balance, and motor control exercises. 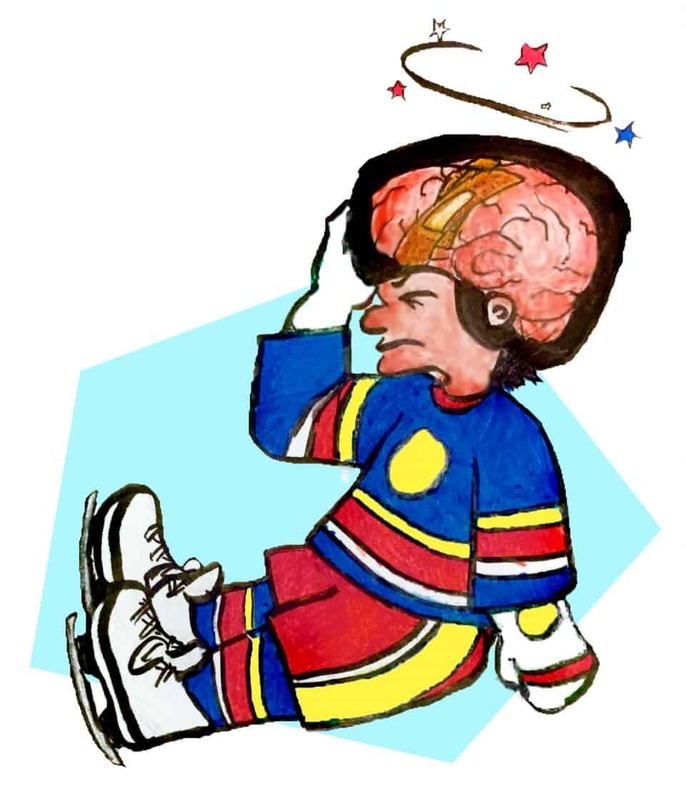 “The active approach is something we start when the concussion symptoms have resolved,” said Dinaut, adding that resuming physical activity, no matter how minimal, helps an athlete feel closer to competition again. Lung transplants save hundreds of lives each year and are among the most vital operations in the medical field. Unfortunately, the procedure comes with an array of risks and, to this day, the leading cause of post-operational death is poor donor lung viability. To maximize success, only a select few donor lungs are deemed appropriate for transplant. But despite rigorous and time consuming assessments of donor lung viability, nearly a fifth of lungs are rejected by their new hosts every year, causing devastating complications and often death. Recent research conducted at the University of Toronto could revolutionize this procedure. Dr. Shana Kelley, a professor of pharmaceutical sciences and biochemistry, worked in tandem with Dr. Shaf Keshavjee, a professor of thoracic surgery, to develop a quick and accurate method to analyze donor lung viability. Their innovation relies on microchips, called fractal circuit sensors (FraCS) initially designed by Dr. Kelley to test for infection. Modified, the microchip can now locate biomarkers in lung tissue, virtually eliminating all error. While the study focuses on lung transplants, Dr. Kelley points out that, “any assessment that can be made on the basis of specific molecular markers can be carried out with our chip.” The chip, then, has the power to completely overturn the field of clinical practice. The chip operates by analyzing a biopsied sample of lung tissue. It detects mRNA biomarkers to determine the lung’s viability. The innovation is unique in that it requires virtually no sample purification before analysis, making the process remarkably fast. Using biomarkers as a method of aiding medical decision-making is widely accepted and promoted. The current methods available, however, require anywhere between six and 12 hours to perform, rendering the practice obsolete for such a time-sensitive operation. This pioneering innovation, in contrast, can determine lung viability in under 20 minutes. The new research will allow doctors to not only analyze lung function when considering donor viability, but also assess lung damage. Most lungs used for transplant today are chosen for their suitability as functioning organs. However, around a third of deaths following transplant are due to a complication known as ‘primary graft dysfunction,’ which is commonly caused by damage already present in the lungs. In a powerful demonstration, the microchip analyzed 52 lung transplants that had already taken place, and yielded a 74 per cent rate of sensitivity and 91 per cent rate of specificity, correctly identifying numerous instances of primary graft dysfunction. The benefits of this new technology go beyond preventing complications. Another major issue in the field of lung transplants is the staggering wait list. In Canada, nearly 300 people died between 1997 and 2006 while waiting for lung transplants. In part, this is due to the fact that surgeons are very conservative with their use of donor lungs to maximize success; only 15 per cent of donated lungs are considered suitable. However, estimates show that around 40 per cent of the lungs deemed unusable may be viable organs. This technology would improve our ability to identify this 40 per cent accurately, thereby reducing wait-lists, and saving lives. Hospital in 1983. Since then, success rates have burgeoned and access has become relatively widespread. Now, Canadian innovation is making it possible to reach more patients and save more lives. The scope if this technology is seemingly endless, but when can we hope to see the innovation used in hospitals? As Dr. Kelley put it, “What we reported […] was a proof-of-concept study. We now need to do a much larger clinical validation study to show that our accuracy is sufficient for clinical use.” Doctors Kelley and Keshavjee are now working to fine tune their innovation, making it ready for clinical use. “Smoking is hazardous to your health,” and, “children see children do” are examples of warning labels covering 75 per cent of the front and back covers of cigarette packages in Canada. Ironically, it can be argued that smoking has become a part of youth culture in efforts to distress, to be ‘cool,’ and to live in the moment. If people already know the negative consequences of smoking, then why do they still smoke? “It is the nicotine rush, it helps me think sometimes I just have to because without nicotine it is kind of weird and I want to stop but I can’t because it is too addictive,” says first-year U of T student Alex*. Earlier this month, the Ontario Tobacco Research Unit (OTRU) published the Youth Exposure to Tobacco in Movies special report, which examined onscreen exposure to tobacco among Ontario youth. The report estimated the impact of this exposure with consideration to new smokers recruited and their tobacco associated mortality and health care costs. “Young people are more likely to [take up] smoking after exposure to onscreen smoking based on analysis of data,” said Robert Schwartz, executive director of the OTRU and associate professor at University of Toronto’s Dalla Lana School of Public Health. Schwartz projected that at least 185,000 children and teens in Ontario will start smoking cigarettes due to exposure to onscreen smoking, based on United States Center for Disease Control models, which account for health effects over a lifetime. “Getting people to agree with the finding was one of the challenges that we faced,” said Schwartz, who personally feels the evidence is convincing enough. “Sometimes young people get encouraged by watching that stuff and they want to smoke too you could probably stop incidents of youth smoking by [proposing a] policy to put a no under 18 restriction on movies with onscreen smoking but it won’t help people that are smoking at the moment,” Jessica, a first-year student commented. *Name changed at the request of the student.